Mountain Tracks approached us 18 months into a web project which had ground to a halt. The agency had taken on a travel website with no prior knowledge of how travel products should be managed and sold. They gave it to one of their team to deliver who ended up out of his depth with the whole thing. They weren't happy with anything about the new website, so they asked us to produce a new one. We gave them a rebrand, including a new logo and look and feel, we designed a new website around our TravelZen system which allowed their product teams to load the content using language they understand - no complex HTML required, and terminology that rings true with Product Managers and Travel Marketers. 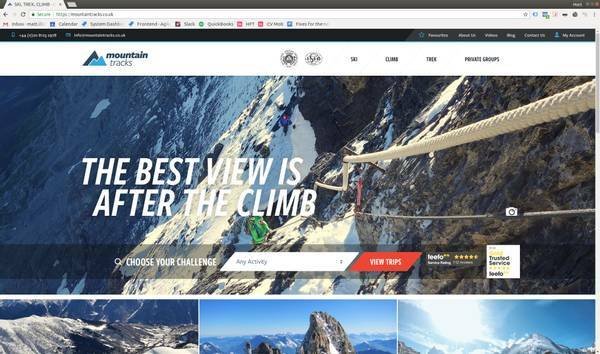 Just before launch, Mountain Tracks were bought by the Ski Club of Great Britain, so we are pleased to be working with the team to integrate the website with their back office systems. "Just to say a big thank you to the whole team for yesterday’s launch. We’ve got our first booking on the new website yesterday! It looks great and a new customer told us on the phone that he has been looking at the website in the past few days and he definitely prefers the new one "
If you are a specialist tour operator in a similar situation, please do give us a call, we can review your project and let you know the best way forward.